The Massachusetts vacation spots of Cape Cod, Martha’s Vineyard, and Nantucket are internationally known. Not as many people know about Rhode Island’s little gem in the Atlantic Ocean, which has some of the most delightful beaches in the northeast: Block Island. It’s easy to reach by air, however, and is a favorite spot for area pilots. In a departure from most of the flight plans in this book, you won’t be departing from the same place you ended the last flight; since that one started and ended at Westchester, I decided that you should get to see a different starting point for this flight. You’ll begin this trip at Bridgeport in Connecticut where you’ll want a COM radio to chat with Bridgeport Ground and Tower, but you won’t need any navigation radios for this flight—you’ll be relying on the Mark I Eyeball to find your way to the destination. The only tricky part is tracking your course with a wind present. There is a steady breeze blowing out of the west (not unusual for the area in some seasons), and you’ll have to compensate on some legs. I’ve set the wind to be “straight down the numbers” at Block Island, but if you want a more realistic experience landing at the Crosswind Capital of New England (and you have a set of rudder pedals to give you the control you’ll need), try swinging the wind around to the northwest—a more accurate heading for the region’s winds. The other concern that governs the routing for this trip is the fact that Block Island shares one attribute with most other islands; it is surrounded by water. While you could just launch and head straight for it, I’ll keep you flying over land as much as possible so that you have a chance at finding a dry place to set down in the unlikely event of an emergency. 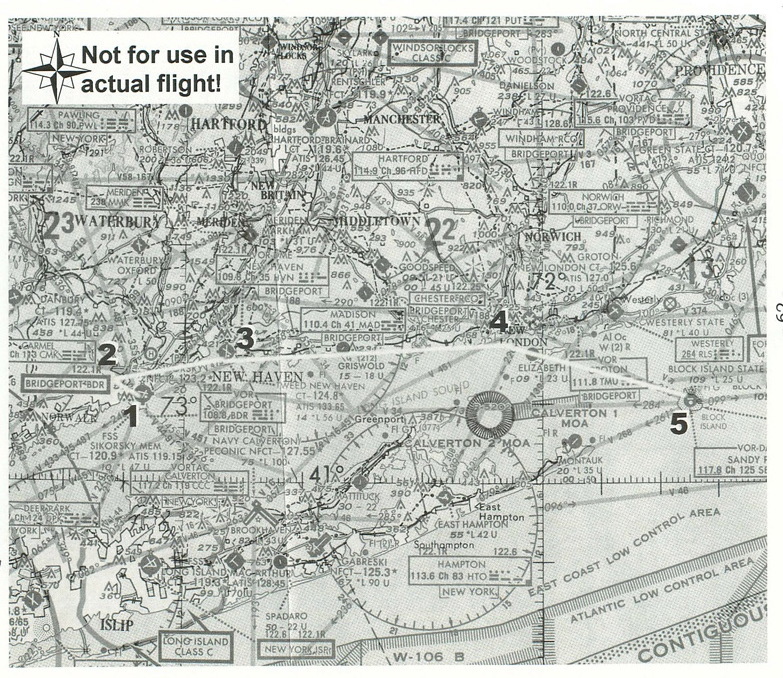 The scanned section of a chart is from the WAC (World Aeronautical Chart) for Long Island Sound, and I’ve marked the chosen route and major checkpoints along the way. Note that the scale is twice that of a normal sectional chart, and you may find it easier to navigate with a sectional if you can get your hands on one. In order to stay near dry land, there are two routes you could pick. First, you could stay over the Connecticut shoreline until you reach New London, and then cross over to Block Island. Another option is to cross over to Long Island first, then fly out to the tip of Montauk and on to Block Island. The second route has a few strikes against it. First, it involves two over-water legs of about a dozen miles each, compared with a single 16 mile leg (which you could make as short as eight miles if you want to minimize the over-water time). Second, you’d be flying over some densely-populated portions of Long Island, and could encounter some traffic congestion over Long Island Mac Arthur (ISP) airport in Islip (with its Class C airspace), Francis Gabreski airport in Westhampton Beach (FOK) and the Navy Calverton Peconic field (CTO) near Riverhead. So I’ll stick with the simpler route and stay over Connecticut. I have prepared a flight log for this trip that shows your route and the checkpoints; it’s pretty simple compared with some of the other flights in this book. You’ll take off from Bridgeport’s Runway 29 (which will be the active if the winds are from 280 magnetic), climb to 1,000 feet before starting a turn to the right, then continue climbing as you fly toward New Haven. Make sure you’re above 2,500 feet before you get within five miles of New Haven, and continue climbing to your cruise altitude of 5,500. I picked that altitude because when traveling between 0 and 180 degrees, you should fly at an odd thousand plus 500 feet. 3,500 feet is a bit low because it can make spotting your checkpoints more difficult, and you don’t want to be too low when it comes time for your water-crossing. On the other hand, it’s not really worth climbing all the way up to 7,500 feet for this short a flight, so 5,500 feet is a good choice. I’ve already entered the headings and estimated ground speeds based on an 80 knot climbing airspeed, 130 knot cruise, and a 15 knot wind at 280 degrees magnetic. If you change any of these parameters for your flight, you will need to recompute the wind corrections and ground speeds. Over New Haven, turn and follow the shoreline to the east. In real life, you would have Interstate 95 visible to follow, but in the default FS5.1 scenery the road peters out somewhere near Guilford. Just stick to the shoreline, and watch for the large physical features to mark your route. About 25 miles after New Haven, you’ll find a sharp inlet that marks the mouth of the Connecticut River (near Old Lyme). And 12 miles further on, you’ll come to the mouth of the river at New London and Groton; you’ll also see Fisher’s Island to your right. Turn and cross over Fisher’s Island and you should see Block Island to the southeast. Don’t be fooled by Montauk point which will be to your south—that’s not where you want to go. The pattern altitude at Block Island is 1,105 feet, so you’ll need to descend to that altitude before you get there. Assuming that you set up a 500 foot per minute descent rate while maintaining the same cruise airspeed (which you can do by cutting back on the throttle instead of pushing the nose over), you’ll need about 9 minutes to make the descent. Since the estimated time for the last leg is 10 minutes, plan on making your turn at Fisher’s Island and then starting your descent once you get settled on course. Once you get to the island, set yourself up for a left downwind entry for Runway 28, and take it on in for a landing. Positioning your aircraft is easy; simply choose the World Airports command from the menu, then Choose USA - New York as the scenery area, and then Bridgeport Sikorsky - Runway 29 as the airport you want to fly from, and choose OK. Note that if you choose Winds Aloft instead of Surface Wind, you will be asked to specify the direction in terms of True instead of Magnetic. If you want to add some challenges to this flight, try changing the wind direction as mentioned earlier. Or change your take-off time to 6:00 PM (1800 hours) and see if you can find Block Island before it gets too dark. Or add a broken cloud deck between you and the ground to provide an extra challenge. Enjoy your trip, and don’t get too much sand in your picnic!